Some folks claimed that Lego's new direction meant the end of the traditional "free play" values the company had always touted, that sets with storylines and defined characters limited the fun kids could have. 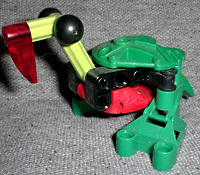 Well, the Lego Club soon disproved that when they began offering alternate instructions for the Bionicle sets. The Pokawi jungle fowl is a small, flightless bird of Le-Wahi with a loud 'pok-pok-pok' call. Pokawi spend their entire lives on the marshy jungle floor, hunting for edible insects and fallen fruits or seeds. When a flock of Pokawi is surprised by a Rahi, each hops away in a different direction, creating a bewildering explosion of sound and color that confuses the predator and helps the birds to escape. I think using the green Levahk claw as a pair of wings works pretty well, but it would probably be better if the thing was symmetrical. Just like the Infernavika, you can use a krana to give it colorful feathers. The Pokawi can bob his head up and down and turn his feet for stability. Instructions for building this set are available online for free to members of the Lego Club in the "Buildit" section. What have you built with your Bionicles? Tell us on our message board, the Loafing Lounge.